It was a short stack of hockey on the National Hockey League ice, with just three games. Two of the contests took place in the Golden State of California, so many east coast fans likely didn't bother to check in. If you didn't manage to catch the games, two of the three battles were pretty good, while the Carolina Hurricanes were outclassed by the San Jose Sharks. Speaking of beatdowns, my C League team took one in Garner, N.C. in Game 1 of the playoffs, but Royally Pucked will be back. Somehow yours truly was credited with a goal, too. Hey, it looks good on the scoresheet. Let's get started! This was a pretty entertaining game. Cam Talbot received the starting nod for the Oilers and it appeared things were going to go south for him like they have been recently. Ivan Barbashev struck for a goal just 6:05 into the game to give the Blues an early lead. Brayden Schenn followed that up a few minutes late on another even-strength goal to give the home side a 2-0 lead heading into the room. That was actually the last time the home fans would see their team light the lamp for the evening. Talbot had it on lockdown after that, yielding just the two goals on 30 shots. It was his first win in seven attempts dating back to Oct. 28, as it was much needed. 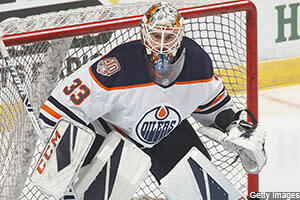 Mikko Koskinen has been carving into his workload, forcing Talbot to the back burner. But he's a proud veteran and shouldn't be discounted just yet. Ryan Nugent-Hopkins sliced the lead in half at 4:04 of the second period, beating Jake Allen for the first time. The Blues backstop managed to stop 34 of the 36 shots he faced, giving his team a chance to win. He just received no offensive support after the team emerged from the room following Period 1. The Oilers were getting desperate in the final minute of regulation, pulling Talbot for an extra attacker. The move paid off, as Oscar Klefbom flipped the switch for his third marker of the season to force overtime, and no one was able to break through in the extra session so a shootout was necessary. Connor McDavid picked up the assist, and he was the difference maker in the shootout after beating Allen. Jujhar Khaira, Darnell Nurse and Kris Russell each added a helper for the visitors. The Oilers were also in a hitting mood, too, as Zack Kassian picked up five hits, following by Milan Lucic who delivered four hits. Khaira also added a blocked shot and three hits over 13:15 of ice time. For the home side, Chris Butler, Vince Dunn, Jordan Nolan and Oskar Sundqvist notched an assist for their fantasy owners in this one. On a negative note for Leon Draisaitl, he was blanked to snap a four-game point streak. The Ducks entered this game on a four-game winning streak, while the Blackhawks entered the day with a dismal 5-22 mark in their past 27 against Pacific Division foes, while going 12-25-2 in their past 39 trips to Anaheim. The Ducks were also 13-3 in the past 16 at home against teams with a road winning percentage under. 400. You can add another win to the column for Anaheim, although it was actually pretty close. Like the Blues, the Ducks jumped all over the visitors with two goals in the first period to take a 2-0 lead to the room after 20 minutes. Brandon Montour opened the scoring 5:41 into the first period, and the newly acquired Daniel Sprong etched his name onto the scoresheet 20 seconds later for his first goal in an Anaheim Ducks sweater. The Blackhawks fought back with goals from Erik Gustafsson and Alex DeBrincat to tie the game at 2-2 heading into the final period. There's something about facing Anaheim which agrees with DeBrincat, as he has four goals and eight points over his past five meetings with the Ducks. Remember that for DFS purposes on Feb. 27 when the 'Hawks return to the Pond. John Gibson stepped up his game in the third period, stopping all shots he faced. Overall he allowed just two goals on 27 shots to pick up the home win. He was the beneficiary of Ondrej Kase's fourth goal of the season from Carter Rowney and Kiefer Sherwood, putting Anaheim ahead for good. It was the eighth-career game-winning goal for Kase, and he has a point in seven of the past eight. For insurance, Jakob Silfverberg added an unassisted empty-netter stealing the puck at the blue line and firing it into the unattended cage. Hampus Lindholm picked up an assist with a plus-1 rating which was nice for fantasy owners, but he helped those in pools with advanced scoring systems by blocking three shots and delivering five hits. Adam Henrique and Pontus Aberg picked up assists in the game, too. Henrique was able to extend his point streak to six games, posting a goal and six points during the stretch. Aberg has managed three goals and five points across the past three. The home team has now won seven of the past eight meetings in this series between Eastern and Western Conference combatants. Carolina is also now 2-6 in their past eight road games, 0-5 in the past five against Pacific Division foes and 2-6 in the past eight against Western Conference opponents. Meanwhile, San Jose improved to 7-2 in their past nine at home following this convincing win. The theme of the night was a 2-0 lead for the home team after one period. The Sharks made it a perfect 3-for-3 on this slate, picking up an even-strength goal from Barclay Goodrow just 3:44 into the game, while Tomas Hertl picked up a power-play goal midway through the period to excite the home fans. Unlike the other games, the home side kept their foot on the gas as Timo Meier and Joe Pavelski made it 4-0 before the Hurricanes were finally able to end Martin Jones' shutout bid late in the second. Lucas Wallmark buried a power-play goal on assists from Dougie Hamilton and Jaccob Slavin to briefly give Carolina some momentum. Marcus Sorensen finished the scoring in the third, however, as the hoe team skated away with a four-goal win. Curtis McElhinney was roughed up for all five goals on just 23 shots to slip to 7-3-1 with a 2.36 goals-against average and .920 save percentage.